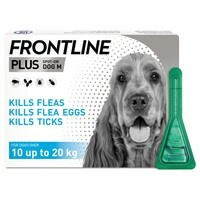 Frontline Plus for Medium Dogs is a topical application for the treatment of flea infestations, alone or in association with ticks and/or biting lice in medium breed dogs weighing 10 - 20kg. Each 1.34ml pipette contains Fipronil 134mg and (S)-methoprene 120.6mg. Great price and the product is the best I have ever used. My dog was prone to the odd flea here and there for a couple of month but after using this product, the problem has been under control for months now. Well worth the money.